I remember it so clearly: one minute he was having a fantastic game of catch the frisbee and chasing Cricket with her frisbee, the next minute a yawning chasm opened up before him, swallowed his front leg and twisted his shoulder. The shrieking! Ow ow ow, he cried. After a visit to the vet for x-rays, diagnosis and anti-inflammatories, he was sentenced to a few weeks’ bed rest. But the whole thing was made easy because Coco loves his crate, takes himself there when tired, and knows to settle down as soon as he’s in it. We also do a lot of matwork, regularly. This translates now to any mat or bed I point him to. He will stay there until released. He got regular sessions with his very own Canine Massage Therapist to aid a fast recovery, which he absolutely loved. So while I was working, he was stretched out on his bed beside me. When I couldn’t be paying attention he could go in his crate. I was able to achieve the bed rest prescribed by the vet without any stress on the part of my dog. An injured dog is already stressed enough. Confining a dog who isn’t used to it could add a lot more anxiety and tension. Of course Coco got out for garden visits, lap visits, and some trick training, aka therapy for the injured leg (“Take a Bow” gave him an excellent shoulder-stretch). But preventing him racing and playing with the other dogs was the hard part. Soon we were able to graduate to short road walks. It was a while before young Mr.Coco was joyfully chasing his frisbee again. But at least the time passed calmly. Could your dog do this? You never know when you may need to keep your dog quiet for a period. 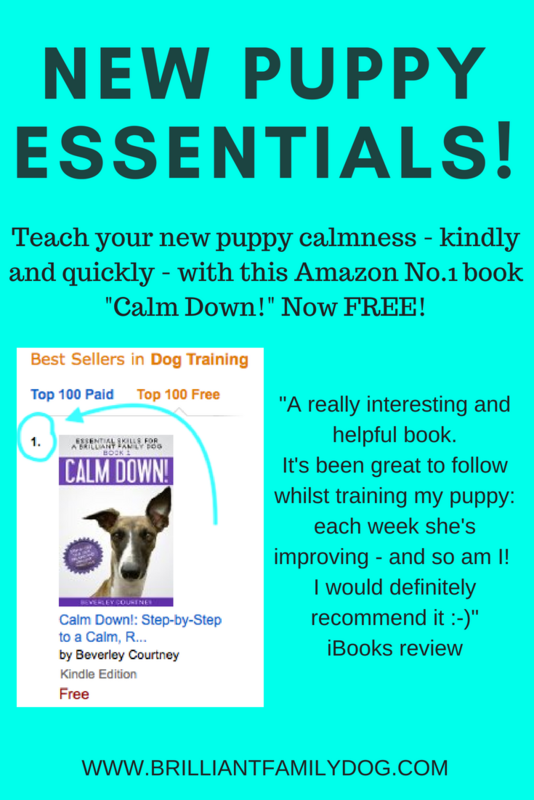 Want to know how to get your dog to this calm, accepting state? Go to Calm Down and get your free copy. Now you can work through the steps and teach your dog how to relax - any time, any place, any how. It is an enjoyable method, gets super results, and makes life easier for all of us. But why listen to me when you can see what readers think! I love your books! Your simple, fun, and loving training methods are helping me make tremendous progress with my brilliant puppies. This book is excellent and so clearly written my 7 year old is enjoying working through the stages with us. After two short training sessions our 9 week old pup is already lying on his mat as soon as I put it out. The author is clearly very knowledgable and when I emailed her a question I received a very informative personal reply. I have read books 2 and 3 in the series also and can honestly say they make training my pup an absolute pleasure for both of us. Three dog trainers, two behaviour specialist vets, three vets ... and a six month old terrier who thinks he’s a tiny pup, a fierce crocodile, and a bucking bronco. Went to purchase your book Calm Down! but got it for zero payment on Amazon. Read it, started training - immediate success. The difference has been amazing, pup is now snoozing near me, with a constant eye on me but definitely better! I want to send you a big, heartfelt thank you. I bought Calm Down! before the arrival of my 8 week old puppy. In under 5 days I had him leaping onto the mat and lying down waiting for his treats. It was just amazing! I can honestly say your books have changed the lives of me and Bo. He loves nothing more than learning new things and playing games, he loved every single part of the process. Your "Calm Down" book saved me. Literally! It's only been a week and she is a different dog, relaxed lying at my feet on her mat. I don't hate her any more and have allowed myself to bond with her. I really didn’t think this would ever happen as she was making my home life so stressed out. Thank You! A surprisingly easy and fun skill to teach! So go get your book and get started!